On November 15th meteorologists were telling us to be prepared for 5”-8” of snow starting that evening and into the next morning. This is very early for us to be getting this much snow! 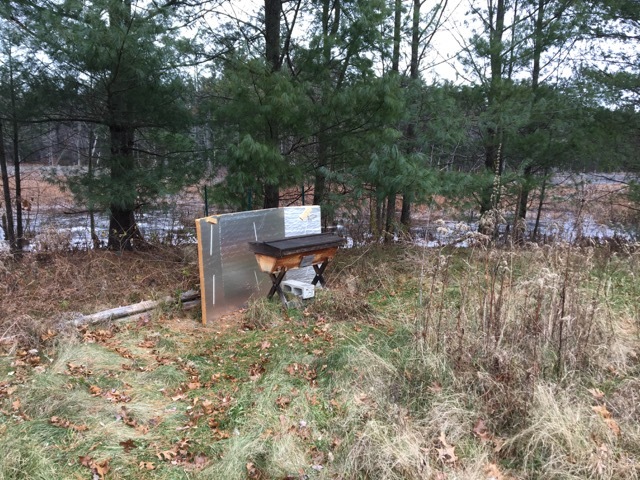 I wasn’t completely convinced, but I wanted to at least check on the hives and take the baffles off of the hives at Old Frog Pond Farm. There wasn’t anything that I needed to do for the Meadow Hive. It was really cold out, only about 25 degrees or so. With the temperature so low the bees would not be out flying. Since they would be inside I only brought my veil, just in case. At the Orchard Hive there was not a bee in sight. I did not want to even open the window since it was so cold. The wind break was still in good condition which was a relief since it has been very windy lately. 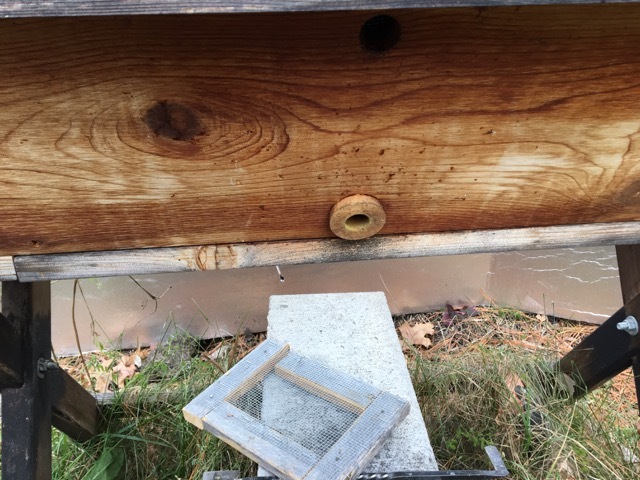 Using my hive tool I popped off the baffle and then quickly added the entrance reducer to the hole. The process was quick and easy. Not one bee came out to see what I was up to. 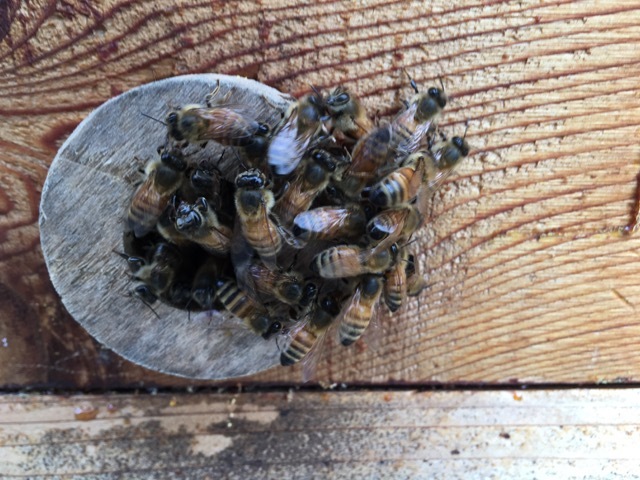 I am fairly certain that they are all clumped on the pile of sugar that I had put into their hive. Removing the baffle will allow them to clean out the dead bees from the hive more easily and allow the other bees to get out on days when it is warm enough. Things went differently at the Willow Hive. 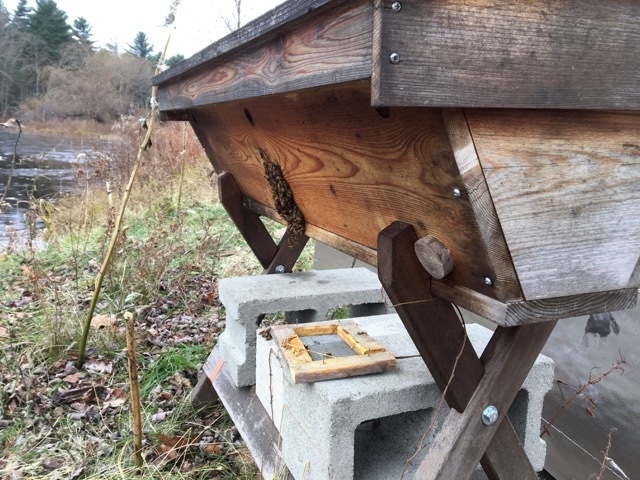 When I took off the baffle, bees poured out of the hive! It looked like when I dump a package of bees into a hive. Several of them came out at me and the little gloves that I had on would not protect me against stings. There were so many bees out of the hive and it was too cold for them to be outside long. I needed to get the entrance reducer on, but there were too many bees there. I decided that it would be best if I went home and got all of my gear on and then come back. Once I had all my gear on I went back to the Willow Hive and luckily, most of the bees had gone back inside. A few bees had frozen before they were able to get back in. Now that they were back in the hive, I could put the entrance reducer on. Of course, when I did several more bees came out to see what I was up to. Once they realized I wasn’t doing anything else to their hive, they went back inside. I waited until they were all back in and then checked on the wind break. The wind break around the Willow Hive had some damage. One of the scored sides had torn through. It was all still attached to the fence posts, so it was still blocking the wind from hitting the hive. I will just need to keep an eye on it and make repairs as necessary. 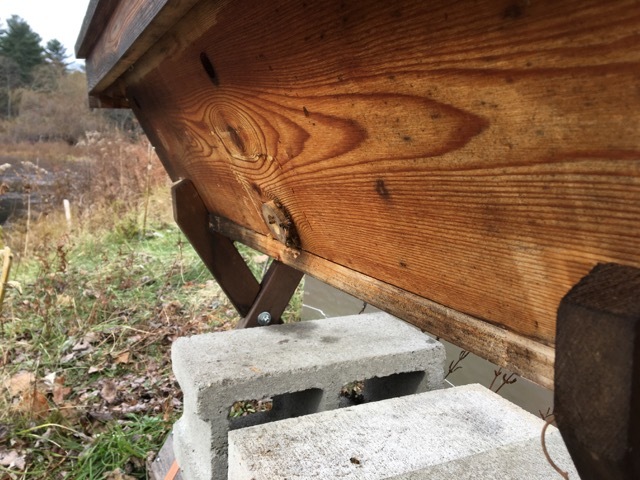 Now the bees should be ready for the first snow of the year, but I am not!